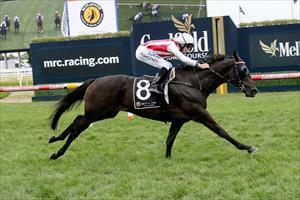 Pollard makes his debut and Top Of The Range steps out in distance at Moonee Valley on Friday night. Pollard runs in race one. the Super VOBIS 2YO Plate over 1000m with Patrick Moloney riding from barrier three after scratchings. The son of Love Conquers All pleased Mike Moroney in his 800m jumpout last Friday against older horses. “The scratchings have made it interesting but it is still a strong race as you would expect at this time of the year,” Moroney said. “He’s drawn well and with his gate speed should be able to settle on the speed. “He still needs a bit of practice. more for his race smarts than anything else but this looks a nice race to start him off in. Top Of The Range (pictured) runs in the second race, the MSC Signs Stayers Series Heat over 2500m with Michael Poy reducing his weight to 57 kg. It will be the furthest distance Top Of The Range has contested however, Moroney feels the son of Savabeel is now looking for further. “We’ve taken the blinkers off him and using Michael Poy to claim,” Moroney said. “He works without blinkers most of the time and works well. “I’m really happy with the horse, he looks terrific and is going well. I think he’s been telling us he’s looking for the trip so we will see tonight. “If he can handle Moonee Valley then I think it’s a winnable race for him.